In The Space Between Us, violinists, violists and cellists surround the audience while robotic percussion instruments created by renowned Seattle artist Trimpin are played remotely via the Radiodrum, a 3D percussive controller, performed by soloist Andrew Schloss. The music literally hangs in the air, activating 18 robotic orchestra chimes, along with robotic piano (Disklavier), xylophones and glockenspiel. The music for this menagerie was created by San Francisco composer David A. Jaffe, protégé of the late spatial music pioneer, Henry Brant, to whom the work is dedicated, and whose instruments Jaffe inherited from Brant to create this work. This is the Seattle premiere of the work, which was commissioned by the San Francisco Other Minds Festival. Inter-continental space is traversed as well, with an American/Russian summit meeting in the form of Dimitri Shostakovich’s magnificent 9th quartet, performed by the Lafayette String Quartet, resident quartet at the University of Victoria. 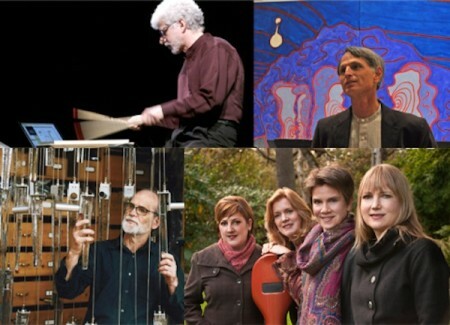 The concert is rounded out by the bluegrass virtuosity of Jaffe’s Cluck Old Hen Variations and the eerie computerized-bird dialog of Jaffe’s Impossible Animals (both Seattle premieres), as well as the haunting Poem by the early 20th century English composer, Rebecca Clarke. Performers: Andrew Schloss, David A. Jaffe, Ann Elliott-Goldschmid, Karen Bentley Pollick, Heather Bentley, Steve Creswell, Brian Wharton, and the Lafayette String Quartet. Thanks to Yamaha USA. <em>The Space Between Us</em>, for 8 strings, and robotic percussion instruments was supported by New Music USA. To follow the project as it unfolds, <a href=”https://www.newmusicusa.org/projects/the-space-between-us-for-8-stringsand-robotic-percussion-instruments/” target=”_blank”>visit my project page</a>.